This page has been published at the request of many CFRs who are seeking to expand their knowledge and understand ECG tracings, it isn’t a training course, simply a reference resource and the best people to discuss this topic with is the qualified ambulance crew. The illustrations are very clear but it is far better to look at an actual ECG chart that relates to the condition in hand. Compare a real ECG with the illustration and then read the explanation, hopefully it will begin to make sense. In order to understand an ECG it is important to learn the waveform components. Each tracing consists of waveform components that indicate electrical events during one heart beat.The graphic here illustrates waveforms that are labeled P, Q, R, S, T and U. Note the P wave, it is the first short upward movement of this ECG tracing and indicates that the atria are contracting and pumping blood into the ventricles. Then we have the QRS complex, it normally begins with a downward deflection (negative) followed by Q; a larger upwards deflection (positive), then a peak (R); with a downwards S wave. The QRS complex represents ventricular depolarization and contraction. The T wave is generally a modest upward (positive) waveform and represents ventricular repolarization. On a real ECG chart you will see there are three rows because there are three leads, I, II and III. Lead I : between the right arm (-ve) and left arm (+ve electrode) . Lead II : between the right arm (-ve) and left leg (+ve electrode) . Lead III : between the left arm (-ve) and left leg (+ve electrode) . However, the ECG only detects three actions, it doesn’t actually measure the physical contraction & relaxation of the heart, it deals with the electrical properties – this is the very reason why it is called Electro. The electrical properties it does detect are depolarization and thus detects cardiac contraction as well as repolarization detecting cardiac relaxation. See Anatomy of the heart. This extract from an ECG chart shows the P wave, QRS complex and the T wave. You can see the small P wave, followed by the QRS complex with a drop for the S wave followed by a T wave further along. As mentioned earlier the ECG shows three of the heart activities, yet there are five letters and sometimes six (U) …why? P wave: represents the depolarization and contraction of the atria. T wave : represents the repolarization and relaxation of the ventricles. Sometimes an ECG may show a small positive (upward) U wave following the T wave , The U wave represents the last remnants of ventricular repolarization. Inverted or prominent U waves indicates underlying pathology or conditions affecting repolarization. Watch out for a U wave. So, we have established that the ups and downs, also known as positives and negatives are called ‘waves‘ and a series of waves are called a ‘complex‘ – as in QRS. The next items we need to look at are ‘intervals‘. These are illustrated on the adjacent chart. RR interval: indicates the rate of ventricular contractions and using it we can detect the Heart rate . Under normal circumstances PP & RR intervals are both equal. Normal sinus rhythm is the rhythm of a healthy normal heart. A sinus rhythm of less than 60/min is called sinus bradycardia. This may be a consequence of increased vagal or parasympathetic tone. Someone who is ‘brady’ has a slower than normal heart rate. A sinus rhythm of higher than 100/min is called sinus tachycardia. More often in response to physical exercise or psychical stress, but may also result from congestive heart failure. Someone who is ‘tachy’ has a faster than normal heart rate. If the sinus rhythm is irregular, for instance, the longest PP- or RR-interval exceeds the shortest interval by 0.16 s, then the situation is called sinus arrhythmia, it is not restricted to certain ages and is very common in all age groups. however, on the basis that it is very common in young people it is not considered a heart disease. A common cause for the sinus arrhythmia may be the vagus nerve which mediates respiration as well as heart rhythm is active during respiration and, through its effect on the sinus node, causes an increase in heart rate during inspiration and a decrease during expiration. The effect is particularly pronounced in children. Note, that in all of the preceding rhythms the length of the cardiac activation cycle (the P-QRS-T-waves together) is less than directly proportional to the PP-time. The main time interval change is between the T-wave and the next P-wave. This is easy to understand since the pulse rate of the sinus node is controlled mainly by factors external to the heart while the cardiac conduction velocity is controlled by conditions internal to the heart. The origin of atrial contraction may be located somewhere else in the atria other than the sinus node. If it is located close to the AV node, the atrial depolarization occurs in a direction that is opposite the normal one. An obvious consequence is that in the ECG the P-wave has opposite polarity.. The origin of the atrial contraction may also vary or wander. Consequently, the P-waves will vary in polarity, and the PQ-interval will also vary. Paroxysmal atrial tachycardia (PAT) describes the condition when the P-waves are a result of a re-entrant activation front (circus movement) in the atria, usually involving the AV node and leads to a high rate of activation, usually between 160 and 220/min. In the ECG the P-wave is regularly followed by the QRS-complex. The isoelectric baseline may be seen between the T-wave and the next P-wave. When the heart rate is sufficiently elevated so that the isoelectric interval between the end of T and beginning of P disappears, the arrhythmia is called atrial flutter. The origin is also believed to involve a re-entrant atrial pathway. The frequency of these fluctuations is between 220 and 300/min. The AV-node and, thereafter, the ventricles are generally activated by every second or every third atrial impulse (2:1 or 3:1 heart block). If the heart rate is slow (40-55/min), the QRS-complex is normal, the P-waves are possibly not seen, then the origin of the cardiac rhythm is in the AV node. Because the origin is in the juction between atria and ventricles, this is called junctional rhythm. Therefore, the activation of the atria occurs retrograde (i.e., in the opposite direction). Depending on whether the AV-nodal impulse reaches the atria before, simultaneously, or after the ventricles, an opposite polarity P-wave will be produced before, during, or after the QRS-complex, respectively. In the second case the P-wave will be superimposed on the QRS-complex and will not be seen. In ventricular arrhythmias ventricular activation does not originate from the AV node and/or does not proceed in the ventricles in a normal way. If the activation proceeds to the ventricles along the conduction system, the inner walls of the ventricles are activated almost simultaneously and the activation front proceeds mainly radially toward the outer walls. 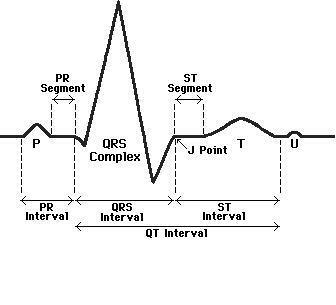 As a result, the QRS-complex is of relatively short duration. If the ventricular conduction system is broken or the ventricular activation starts far from the AV node, it takes a longer time for the activation front to proceed throughout the ventricular mass. The criterion for normal ventricular activation is a QRS-interval shorter than 0.1 s. A QRS-interval lasting longer than 0.1 s indicates abnormal ventricular activation. Ventricular arrhythmias are presented in the image. A premature ventricular contraction is one that occurs abnormally early. If its origin is in the atrium or in the AV node, it has a supraventricular origin. The complex produced by this supraventricular arrhythmia lasts less than 0.1 s. If the origin is in the ventricular muscle, the QRS-complex has a very abnormal form and lasts longer than 0.1 s. Usually the P-wave is not associated with it. The origin of the ventricular rhythm may be located by observing the polarity in various leads. The direction of the activation front is, of course, the direction of the lead vector in that lead where the deflection is most positive. The origin of the activation is, of course, on the opposite side of the heart when one is looking from this electrode. A rhythm of ventricular origin may also be a consequence of a slower conduction in ischemic ventricular muscle that leads to circular activation (re-entry). The result is activation of the ventricular muscle at a high rate (over 120/min), causing rapid, bizarre, and wide QRS-complexes; the arrythmia is called ventricular tachycardia. As noted, ventricular tachycardia is often a consequence of ischemia and myocardial infarction. When ventricular depolarization occurs chaotically, the situation is called ventricular fibrillation. This is reflected in the ECG, which demonstrates coarse irregular undulations without QRS-complexes. The cause of fibrillation is the establishment of multiple re-entry loops usually involving diseased heart muscle. In this arrhythmia the contraction of the ventricular muscle is also irregular and is ineffective at pumping blood. The lack of blood circulation leads to almost immediate loss of consciousness and death within minutes. The ventricular fibrillation may be stopped with an external defibrillator pulse and appropriate medication. A ventricular rhythm originating from a cardiac pacemaker is associated with wide QRS-complexes because the pacing electrode is (usually) located in the right ventricle and activation does not involve the conduction system. In pacer rhythm the ventricular contraction is usually preceded by a clearly visible pacer impulse spike. The pacer rhythm is usually set to 72/min. As discussed earlier, if the P-waves always precede the QRS-complex with a PR-interval of 0.12-0.2 s, the AV conduction is normal and a sinus rhythm is diagnosed. If the PR-interval is fixed but shorter than normal, either the origin of the impulse is closer to the ventricles or the atrioventricular conduction is utilizing an (abnormal) bypass tract leading to pre-excitation of the ventricles. The latter is called the Wolff-Parkinson-White syndrome and is discussed below. The PR-interval may also be variable, such as in a wandering atrial pacemaker and multifocal atrial tachycardia. Atrioventricular blocks are illustrated. When the P-wave always precedes the QRS-complex but the PR-interval is prolonged over 0.2 s, first-degree atrioventricular block is diagnosed. If the PQ-interval is longer than normal and the QRS-complex sometimes does not follow the P-wave, the atrioventricular block is of second-degree. 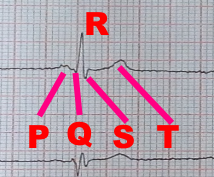 If the PR-interval progressively lengthens, leading finally to the dropout of a QRS-complex, the second degree block is called a Wenkebach phenomenon. Trifascicularly, located still lower, so that it exists in the right bundle-branch and in the two fascicles of the left bundle-branch. Bundle-branch block denotes a conduction defect in either of the bundle-branches or in either fascicle of the left bundle-branch. If the two bundle-branches exhibit a block simultaneously, the progress of activation from the atria to the ventricles is completely inhibited; this is regarded as third-degree atrioventricular block (see the previous section). The consequence of left or right bundle-branch block is that activation of the ventricle must await initiation by the opposite ventricle. After this, activation proceeds entirely on a cell-to-cell basis. The absence of involvement of the conduction system, which initiates early activity of many sites, results in a much slower activation process along normal pathways. The consequence is manifest in bizarre shaped QRS-complexes of abnormally long duration. The ECG changes in connection with bundle- branch blocks are illustrated. If the right bundle-branch is defective so that the electrical impulse cannot travel through it to the right ventricle, activation reaches the right ventricle by proceeding from the left ventricle. It then travels through the septal and right ventricular muscle mass. This progress is, of course, slower than that through the conduction system and leads to a QRS-complex wider than 0.1 s. Usually the duration criterion for the QRS-complex in right bundle-branch block (RBBB) as well as for the left brundle- branch block (LBBB) is >0.12 s.
RBBB causes an abnormal terminal QRS-vector that is directed to the right ventricle (i.e., rightward and anterior). This is seen in the ECG as a broad terminal S-wave in lead I. Another typical manifestation is seen in lead V1 as a double R-wave. This is named an RSR’-complex. The situation in left bundle-branch block (LBBB) is similar, but activation proceeds in a direction opposite to RBBB. Again the duration criterion for complete block is 0.12 s or more for the QRS-complex. Because the activation wavefront travels in more or less the normal direction in LBBB, the signals’ polarities are generally normal. However, because of the abnormal sites of initiation of the left ventricular activation front and the presence of normal right ventricular activation the outcome is complex and the electric heart vector makes a slower and larger loop to the left and is seen as a broad and tall R-wave, usually in leads I, aVL, V5, or V6. One cause for a broad QRS-complex that exceeds over 0.12 s, may be the Wolff-Parkinson-White syndrome (WPW syndrome). In the WPW syndrome the QRS-complex initially exhibits an early upstroke called the delta wave. The interval from the P-wave to the R spike is normal, but the early ventricular excitation forming the delta wave shortens the PQ-time. The cause of the WPW syndrome is the passage of activation from the atrium directly to the ventricular muscle via an abnormal route, called the bundle of Kent, which bypasses the AV junctions. This activates part of the ventricular muscle before normal activation reaches it via the conduction system (after a delay in the AV junction). The process is called pre-excitation, and the resulting ECG depends on the specific location of the accessory pathway. Atrial and ventricular muscles react to physical stress in the same way as skeletal muscles: The muscles enlarge with increased amount of exercise. The extra tension may arise as a result of increased pressure load or volume load. Pressure overload is a consequence of increased resistance in the outflow tract of the particular compartment concerned (e.g., aortic stenosis). Volume overload means that either the outflow valve or the inflow valve of the compartment is incompetent, thus necessitating a larger stroke volume as compensation for the regurgitant backflow. The increase in the atrial or ventricular size is called atrial or ventricular enlargement. The increase of the atrial or ventricular wall thickness is called atrial or ventricular hypertrophy. Very often they both are called hypertrophy, as in this presentation. Atrial and ventricular hypertrophies are illustrated in Figures 19.6 and 19.7, respectively. Right atrial hypertrophy is a consequence of right atrial overload. This may be a result of tricuspid valve disease (stenosis or insufficiency), pulmonary valve disease, or pulmonary hypertension (increased pulmonary blood pressure). The latter is most commonly a consequence of chronic obstructive pulmonary disease or pulmonary emboli. In right atrial hypertrophy the electrical force due to the enlargened right atrium is larger. This electrical force is oriented mainly in the direction of lead II but also in leads aVF and III. In all of these leads an unusually large (i.e., 0.25 mV) P-wave is seen. Left atrial hypertrophy is a consequence of left atrial overload. This may be a result of mitral valve disease (stenosis or insufficiency), aortic valve disease, or hypertension in the systemic circulation. In left atrial hypertrophy the electrical impulse due to the enlargened left atrium is strengthened. This electrical impulse is directed mainly along lead I or opposite to the direction of lead V1. Because the atrial activation starts from the right atrium, the aforementioned left atrial activation is seen later, and therefore, the P-wave includes two phases. In lead I these phases have the same polarities and in lead V1 the opposite polarities. This typical P-wave form is called the mitral P-wave. The specific diagnostic criterion for left atrial hypertrophy is the terminal portion of the P-wave in V1, having a duration 0.04 s and negative amplitude 0.1 mV.. Right ventricular hypertrophy is a consequence of right ventricular overload. This is caused by pulmonary valve stenosis, tricuspid insufficiency, or pulmonary hypertension (see above). Also many congenital cardiac abnormalities, such as a ventricular septal defect, may cause right ventricular overload. Right ventricular hypertrophy increases the ventricular electrical forces directed to the right ventricle – that is, to the right and front. This is seen in lead V1 as a tall R-wave of 0.7 mV. Left ventricular hypertrophy is a consequence of left ventricular overload. It arises from mitral valve disease, aortic valve disease, or systemic hypertension. Left ventricular hypertrophy may also be a consequence of obstructive hypertrophic cardiomyopathy, which is a sickness of the cardiac muscle cells. Left ventricular hypertrophy increases the ventricular electric forces directed to the left ventricle – that is, to the left and posteriorly. Evidence of this is seen in lead I as a tall R-wave and in lead III as a tall S-wave (2.5 mV). Also a tall S-wave is seen in precordial leads V1 and V2 and a tall R-wave in leads V5 and V6, (3.5 mV). If a coronary artery is occluded, the transport of oxygen to the cardiac muscle is decreased, causing an oxygen debt in the muscle, which is called ischemia. Ischemia causes changes in the resting potential and in the repolarization of the muscle cells, which is seen as changes in the T-wave. If the oxygen transport is terminated in a certain area, the heart muscle dies in that region. This is called an infarction. These are illustrated here. Goldman MJ (1986): Principles of Clinical Electrocardiography, 12th ed., 460 pp. Lange Medical Publications, Los Altos, Cal. Macfarlane PW, Lawrie TDV (eds.) (1989): Comprehensive Electrocardiology: Theory and Practice in Health and Disease, 1st ed., Vols. 1, 2, and 3, 1785 pp. Pergamon Press, New York. Netter FH (1971): Heart, Vol. 5, 293 pp. The Ciba Collection of Medical Illustrations, Ciba Pharmaceutical Company, Summit, N.J.
Scheidt S (1983): Basic Electrocardiography: Leads, Axes, Arrhythmias, Vol. 2/35, 32 pp. Ciba Pharmaceutical Company, Summit, N.J.
Scheidt S (1984): Basic Electrocardiography: Abnormalities of Electrocardiographic Patterns, Vol. 6/36, 32 pp. Ciba Pharmaceutical Company, Summit, N.J.